Does your family or child use a Amazon Fire device? Making sure the device is child-friendly take just a few moments when you know the steps to take. This guide covers step by step instructions for Amazon Fire devices. 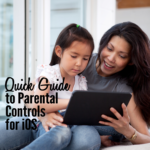 It shows you how to set up parental controls, or how to set up child/teen profiles. And, explains the difference between these 2 options. Download and get parental controls set on your child’s Amazon Fire device today!